DETECTO's low-profile portable wheelchair scale line offers you four different models to choose from based on whether you need to weigh patients in regular size or bariatric wheelchairs and whether you need basic weighing functions or more complex patient measurement operations. The platform is only 2.2 in / 5.6 cm high for easy patient accessibility and comfort while weighing either standing or in a wheelchair. 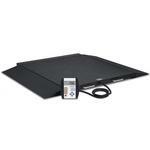 With a high 1,000 lb / 450 kg capacity, the scales are capable of measuring patients of virtually any weight possible. 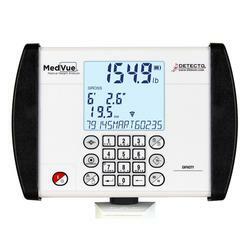 For single-pass weighing to save time, choose the models 6500 or BRW1000 which utilize the MedVue indicator. You can enjoy the time saving benefits of these scales by using the convenient pushbutton or keypad tare which allows you to remove the wheelchair weight all in one pass. 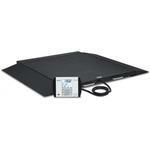 Since the display is connected to the scale by a long coiled cable that extends up to 14 ft / 4.2 m, it can be positioned where the healthcare professional can most easily read the results. By using the versatile mounting bracket that comes with each scale, you may permanently mount the indicator on a wall for long-term static use or set it on a tabletop or desk for more mobile type weighing. 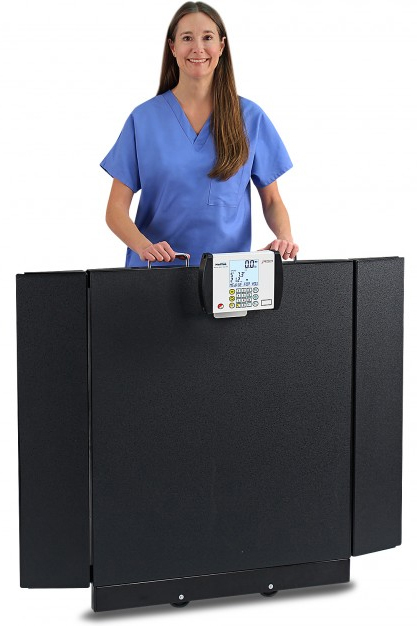 Models 6500/BRW1000 - The MedVue® multifunctional indicator with alphanumeric keypad and RS232 and USB ports (optional Wi-Fi and Welch Allyn connectivity) displays Height, Weight, and Body Mass Index onscreen simultaneously. Capable of 14-digital alphanumeric patient ID entries and 99 stored wheelchair tare weights. Displays in four languages (English, Spanish, French, and German). The MedVue's® ballmount swivel bracket for the back of the indicator allows wall-mount or mobile tabletop weighing with adjustable viewing. The 750 mounting bracket snaps onto the back of the indicator for wall-mount or mobile tabletop weighing.